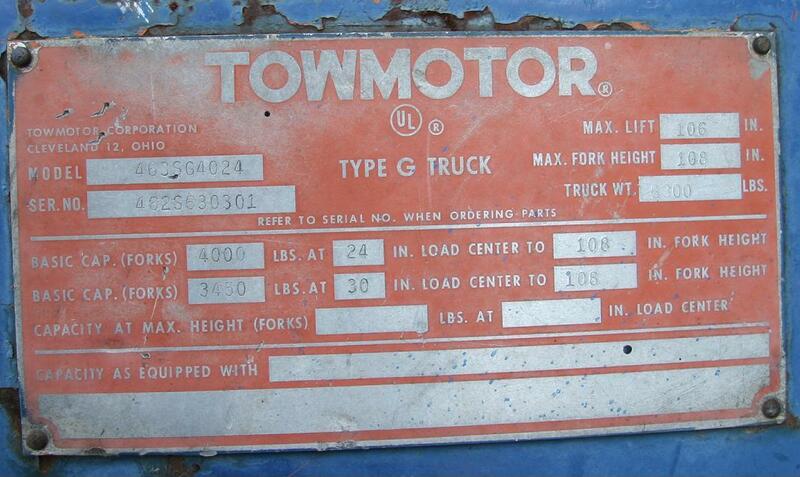 often miswritten as Tow motor. Welcome to the TOWMOTOR fansite ! 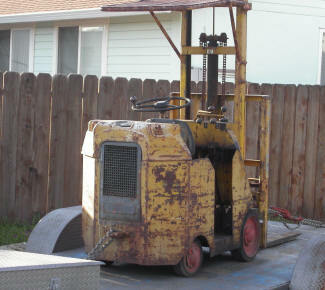 On this page are pictures and "history part 1" of this unique real American forklift. Most pictures can be enlarged by clicking on it. My brother and I with my brothers antique Towmotor. 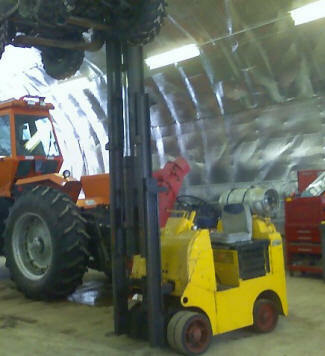 LT35, still hard at work in Ontario Canada, best one we've ever had! And beautifull restored - look at the perfect paint job! Mr Peterson uses this machine to lift 11,000 LBS pipes and even a 19,000 LBS cross head! 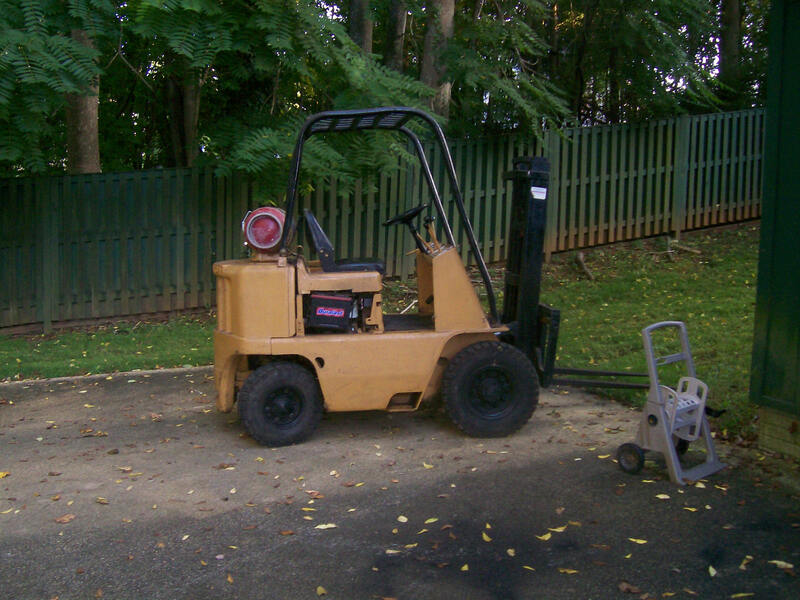 I have an Awesome Towmotor that will pick up anything we try! 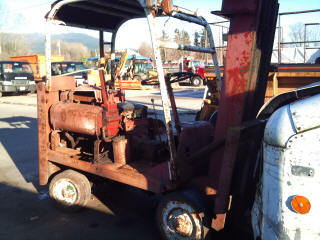 Attached are several photos of our vintage Towmotor Forklift. 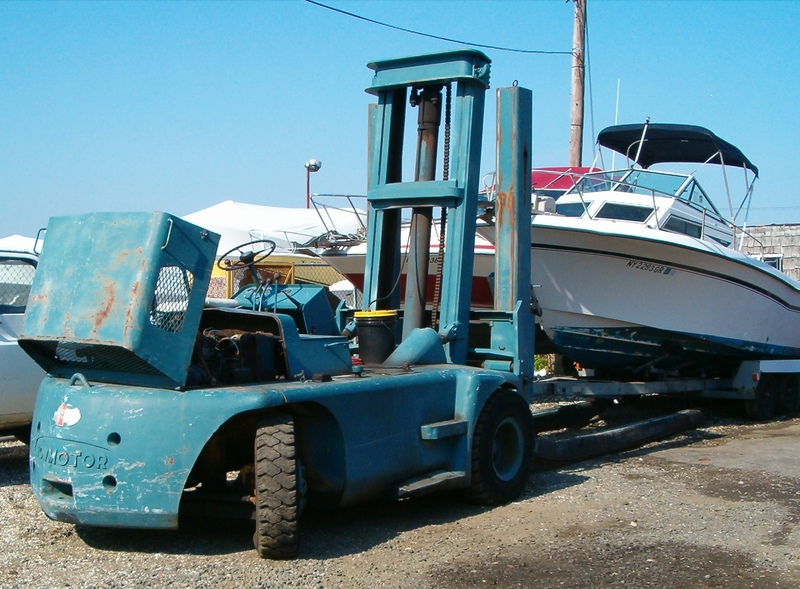 This unit was originally owned by American Hoist & Derrick in St. Paul, MN and stayed behind when the company moved to Wilmington, NC. 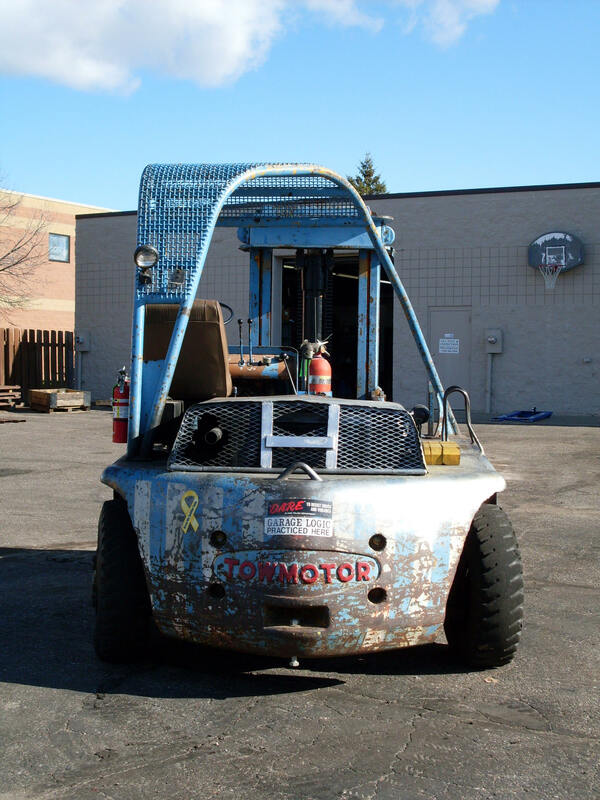 The Towmotor is now owned and operated by All Test & Inspection, Inc. of Blaine, MN. I have operated it regularly for the past 18 years moving test weights and loading trucks. Salve, sono Stella Pasquale, dalla prov. 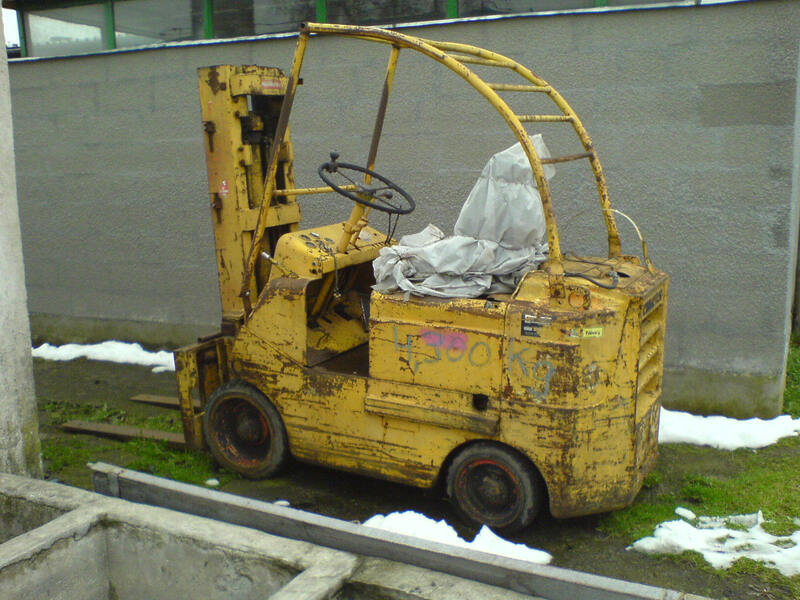 di Taranto, Italy, sono venuto in possesso di un Towmotor una stupenda macchina, era in pessime condizioni e con tanto di mio lavoro di restauro Vi voglio far vedere il mezzo oggi. Hello, I'm Stella Pasquale, from Taranto, Italy. 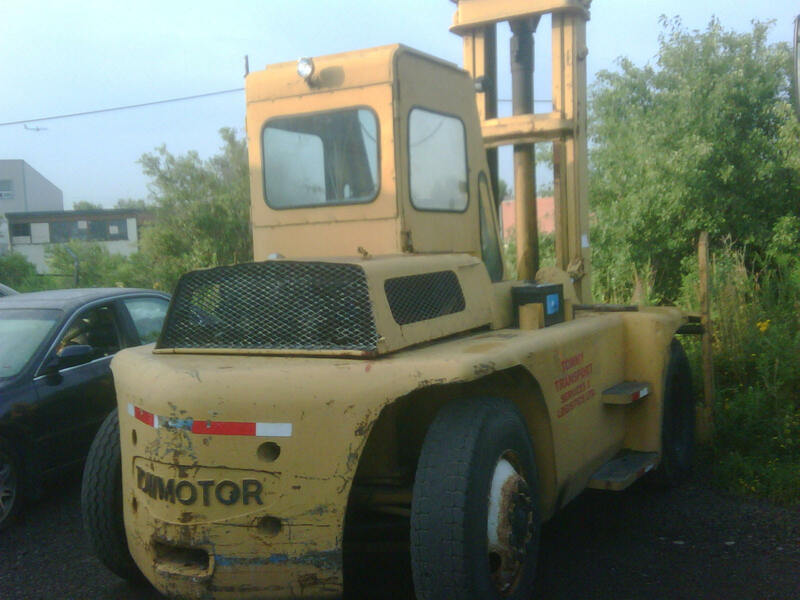 I came into possession of a Towmotor, a wonderful machine but it was in poor condition. But after a lot of restoration-work I think I can show you the good results! Mine is V40B 4000LB Pnumematic tires. Geert... what an awesome site. I found my towmotor lt35 (year unknown) in a guys barn in Vermont, U.S. I did not need a forklift and do not know what I will do with it, but I had to have it. I paid $150 for it. It had been sitting for years. 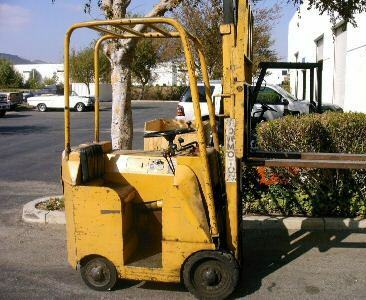 I put a little fresh gasoline in it and jump started it. She purred like a kitten and everything works great! Hello Geert, Hello Willem. 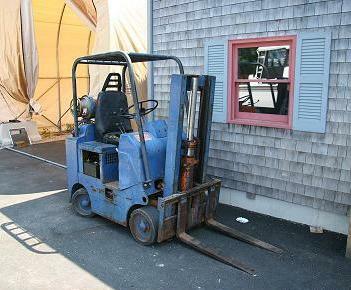 My name is Riechard and this is My forklift "Tommy". I bought it from a scrap yard. They almost killed it and was sending it off when I saw it. 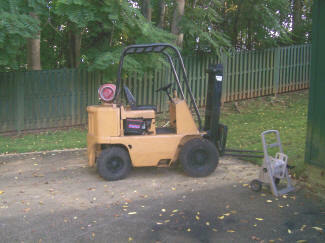 I am a mechanic in the comercial roofing bussiness and needed a forklift badly. That was about seven years ago. I had some repairs to do but in 5 hours it was good to go. It still works every day and works very well. Klick here for the original tagplate ! Very rare and special vehicle, only 11 were built! 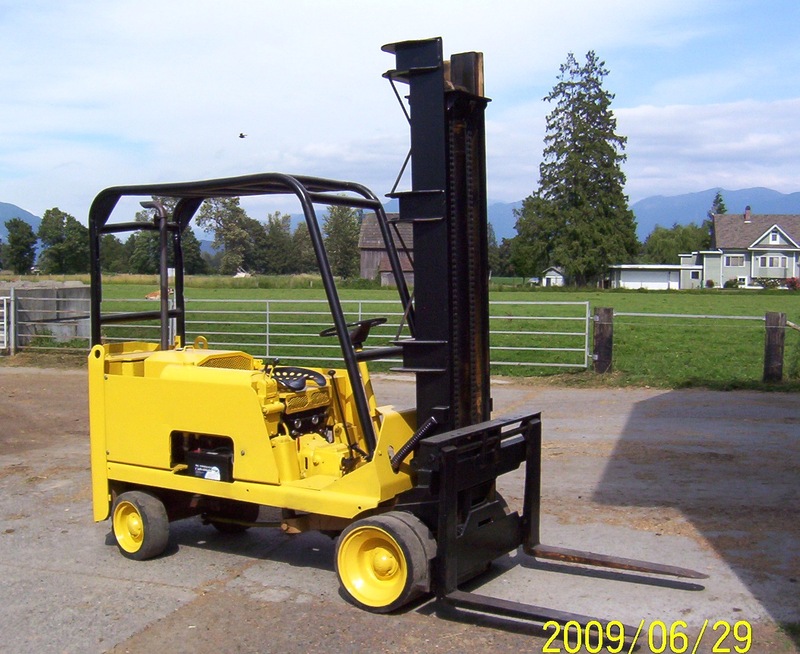 Hi, I live in quebec, canada and I just purchased this tow motor fork lift, I enjoy it. I dont know the year or the model, the sticker is unreadeable. 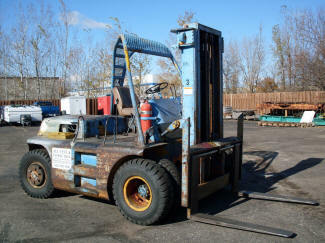 I know it will lift up to 12 feets and 4000lbs and It have dual front wheels. I work in Houston, Texas. 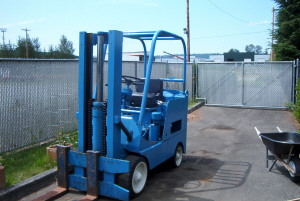 I found your website because I have a Towmotor forklift, and I was curious about the history of the company. 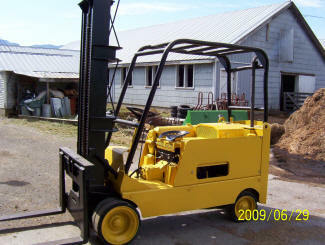 Attached is a photo of my machine. 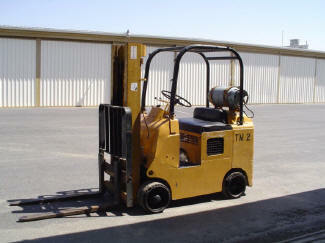 It is a model TC30, Serial Number 12X2033. 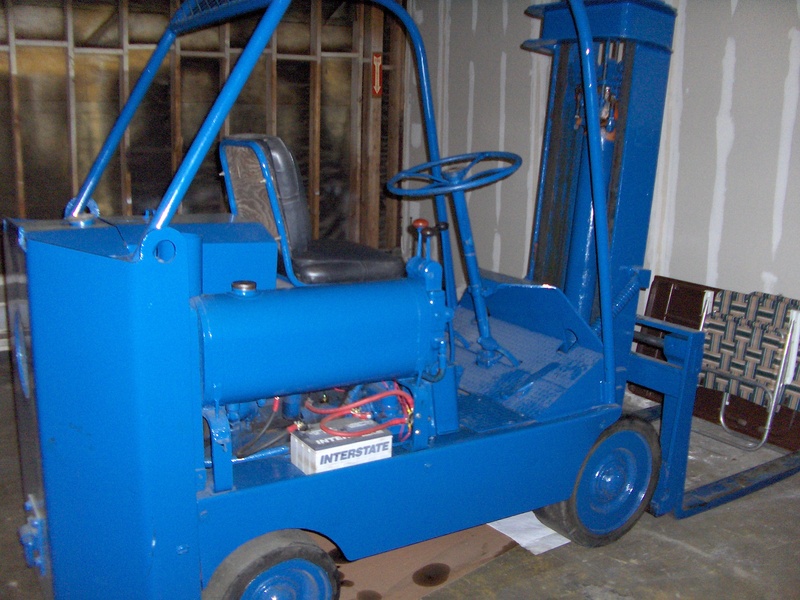 Here is two pictures of "Little Detroit of Norway" 's Towmotor forklift, paintet to blend in with the other vehicles. It "lives" with in an old military warehouse close to Askim in Norway. "Little Detroit Norway" is a group of people that collects and restores old WW2 vehicles like GMC's, Diamond T's, Jeeps and stuff like that we use the Towmotor to do our heavy lifting and moving, it does the job whit flying colors ! Very old, maybe over 60 years. I was impressed by the mountains in the background, I found out I was there in 1997, 2002 and 2008. 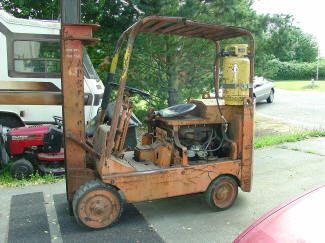 Thought I would send a couple of photos in of my towmotor forklift. 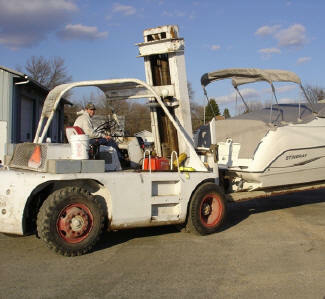 Its sole job is pulling my boat in and out of its garage. I came across your site via a GOOGLE search..........very nice. 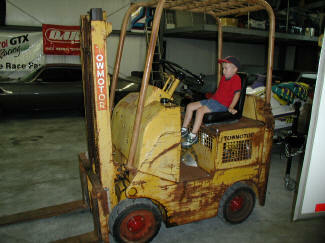 I purchased this Towmotor a few years ago to help me with the restoration of large vintage big rig. I did not pay very much for it and it has performed excellent to say the least. My assumption is that it is from the late fifties to early sixties. 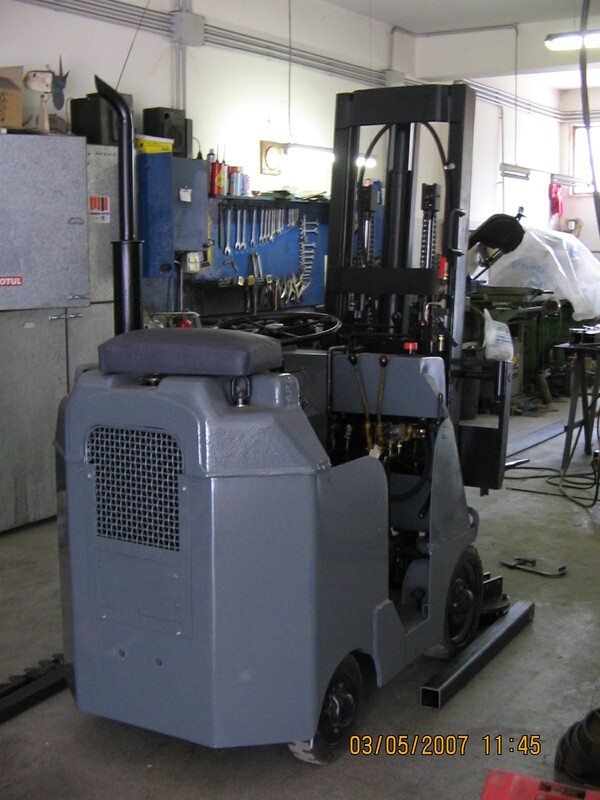 Mr Arownik sent me this pic of a Towmotor built in Denmark at the Vestergaard Brothers workshop in Copenhagen. Look at the roof, I have never seen such a roof before. 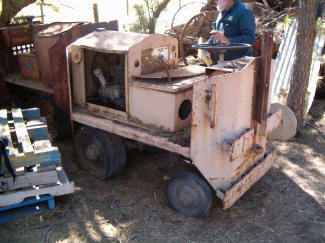 Mr Pinton send me these pics of a machine that must be from the '40ties. 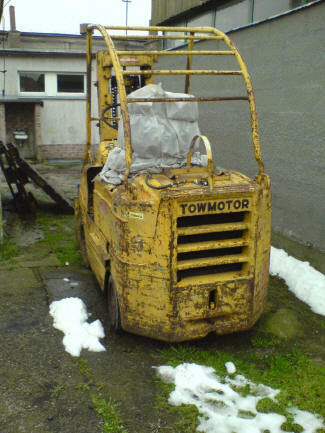 (maybe ex-military) It's however still in use: most Towmotors do last for generations! Here is a picture of our recently refurbished Towmotor Model 502SLP6024. 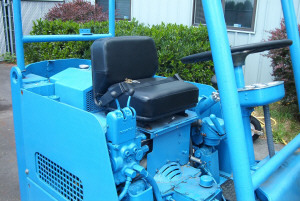 We recently changed the water pump, oil, hydraulic fluid, air filter, patched a radiator hole, and gave it a nice paint job. 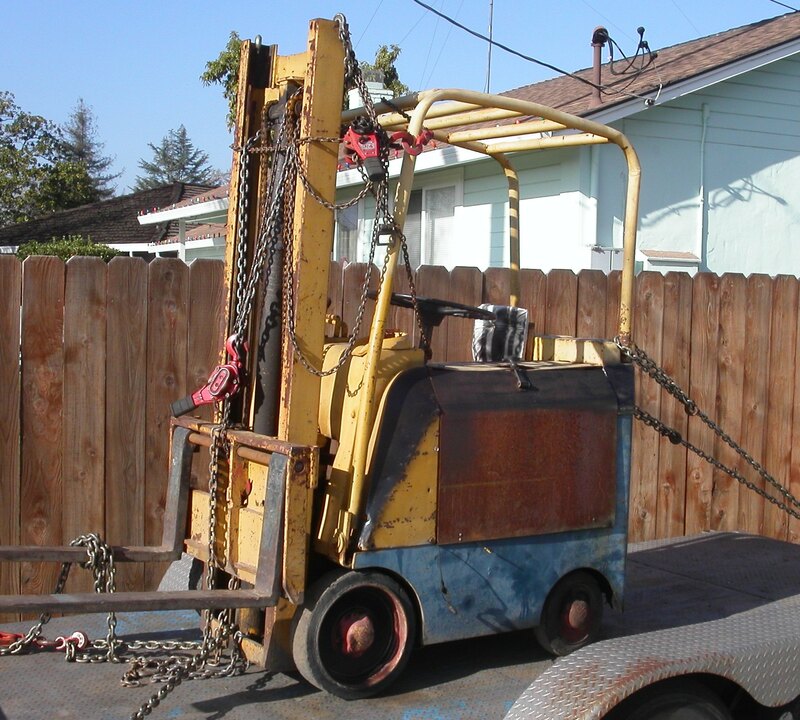 She works like a charm and is in all likely hood 40 years old. P.S. 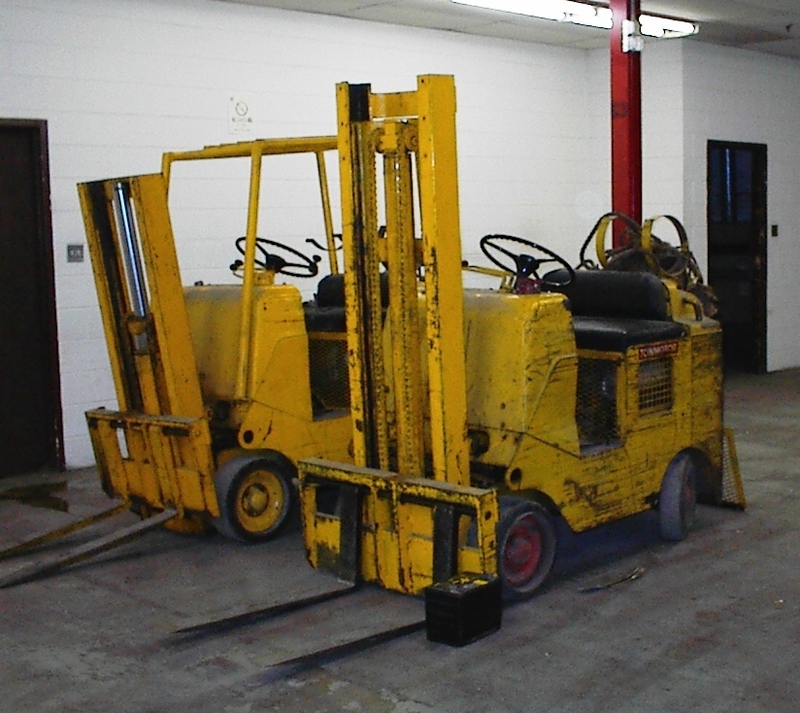 I found this link with a picture of the factory. The picture is dated 1942 and the towmotor in the picture looks just like mine! Wow! Here are some pictures of my before- and after forklift. 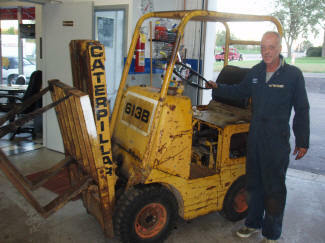 It is a 1966 model 392 with a 112ci continental engine in it. The name plate on the side of the engine says Caterpillar with all the cat info on it. 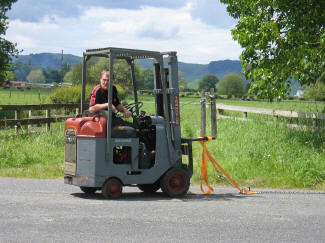 Great web site by the way, hope you like the pictures. If you would like any more info email me. What great site. 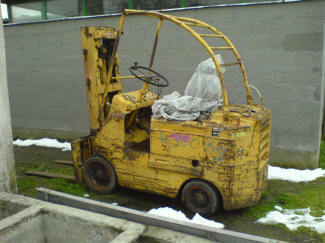 Be great if some factory records could be put on net for all owners to check what they have, and yr of manufacture etc. Here are some photos of two odd Towmotors located in rural South Australia. I don't know the history of either of them, they come with a couple of trolleys. One has a Continental engine the other a Lycoming. They are both now in good hands and will have life breathed back into them. Pat Costello, 'Sparky' for friends. I have the Tow Motor and Plan on Restoring it this winter. I LOVE your site!!! I am from St. Paul, MN and own Hinding Heating and Air Conditioning Company. These Tow Motors are addicting aren't they??? I think Im going to get another one. Mr Mike Mucci (91 years old in 2007) still had some old pictures used for advertising in the 1940ties. Very interesting, very beautyfull and very rare! 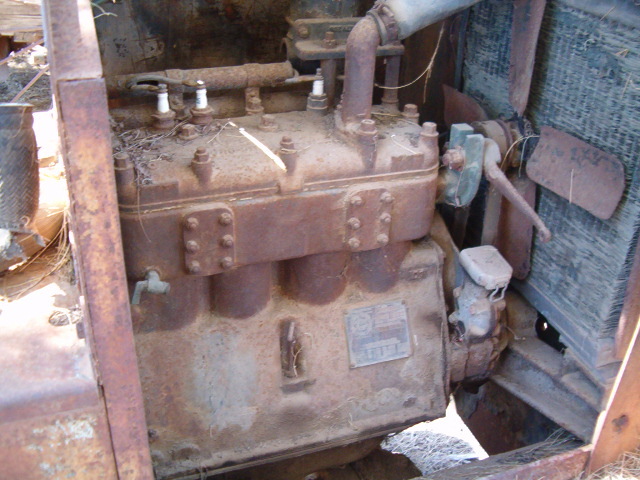 photos of my 56 6000 lb tow motor, Army machine, we use it around our shop, pretty much restored, we love it, give's us that classic look as we restore hot rods. 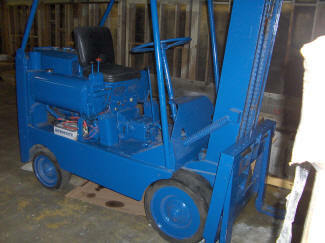 Here is my Towmotor Model 44, s/n 445010. It still runs great. We use it all the time! 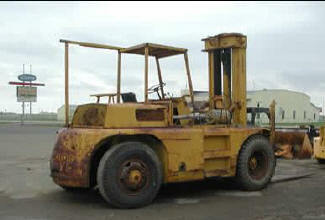 I wonder if the year it was built can be found in the serial number? 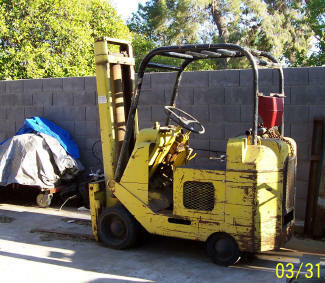 I think you have another of these one sent by Roger in Arizona. We love our Towmotor. She is an old girl, but we wont give up on her. 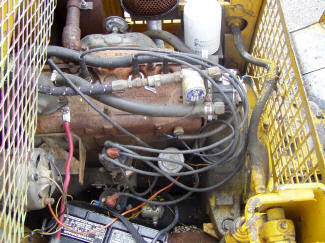 Towmotor with Holden Engine ! I was looking for a workshop manual when I found your site. Here is a picture of my Towmotor. 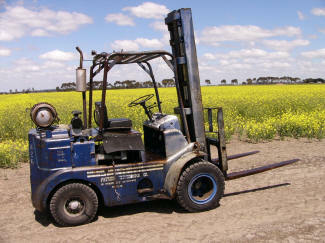 It has been re-powered with an Australian Holden (GMH) 6 cylinder engine. 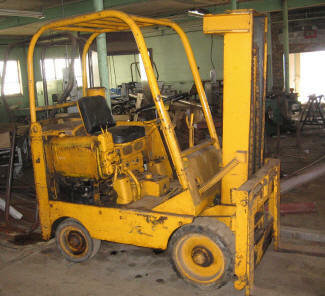 I bought it second hand to use on my farm. 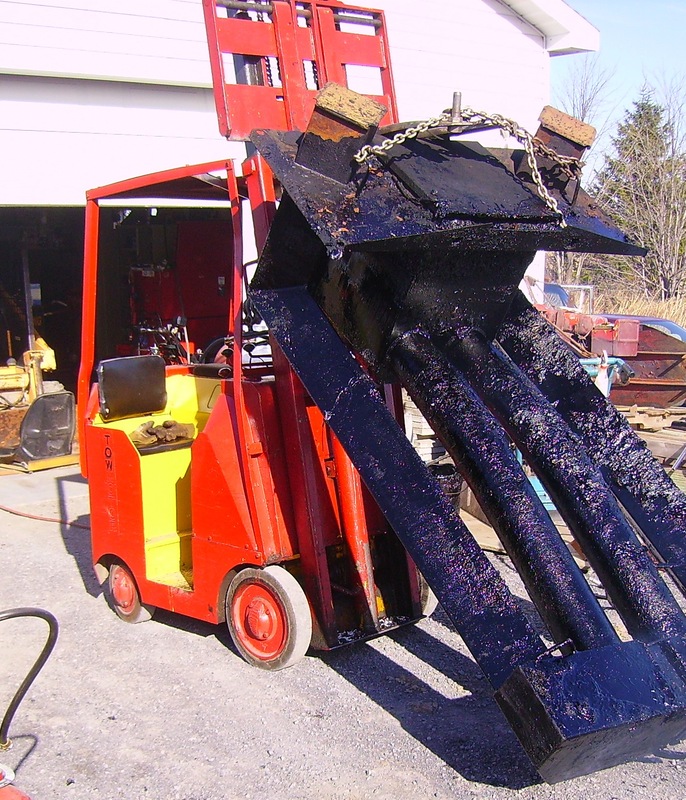 It will get a full overhaul and some new paint next year. Mr Graham Warner, THE forklift specialist from Australia writes that this model Towmotor also originally was built with a Holden engine. 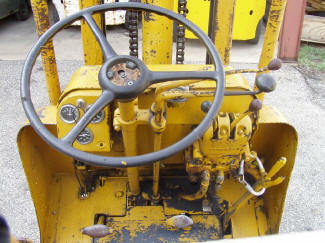 think there from the 1950's because the hydrolic controls are exposed and not hidden in the dashboard. 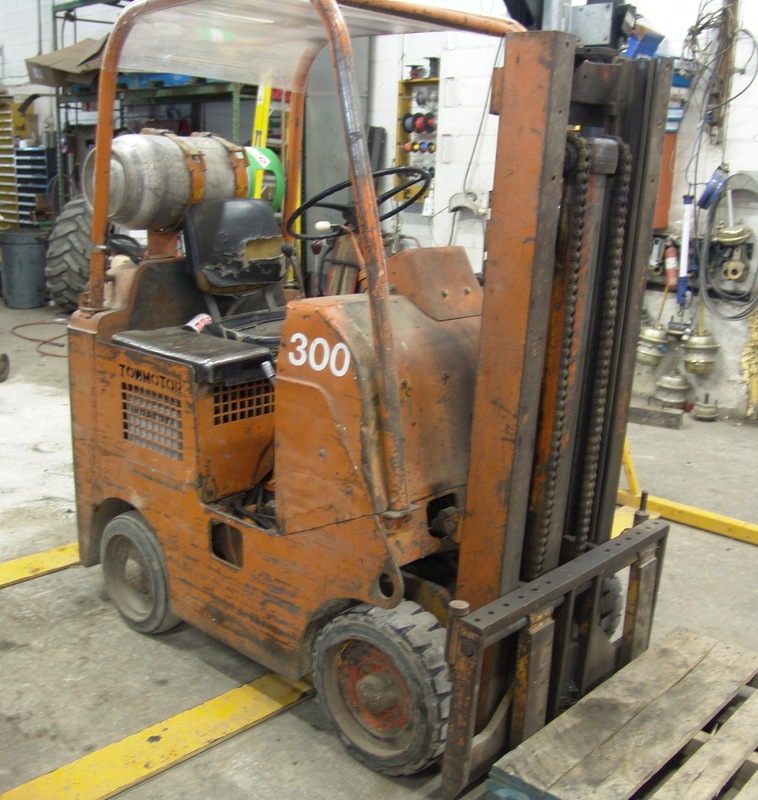 they both run but need complete rebuilds as they have been idle for 15 years. here is some pics for you . have a nice day. 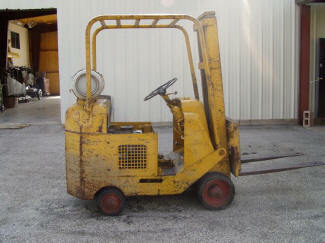 i will send new pics when i restore these fine machines. 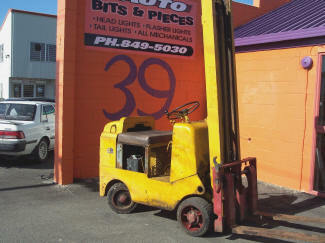 Older model for sale in NY. Here's another older Towmotor Forklift. 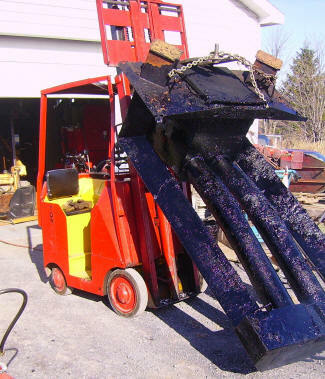 Machine is for sale, presently located in Hudson, NY, USA. I don't have the exact model number in front of me but it doesn't seem to be a model number I am seeing elsewhere. Greetings. 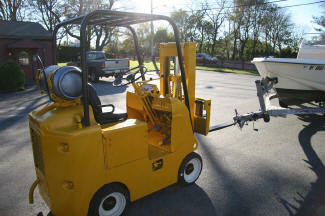 See attached photos of our Towmotor in daily use at Dutchmaster Nurseries, Toronto Canada. We are looking for parts to recondition it. The I.D. plate is missing so for openers, we wish to identify it for the purpose of sourcing parts for it. 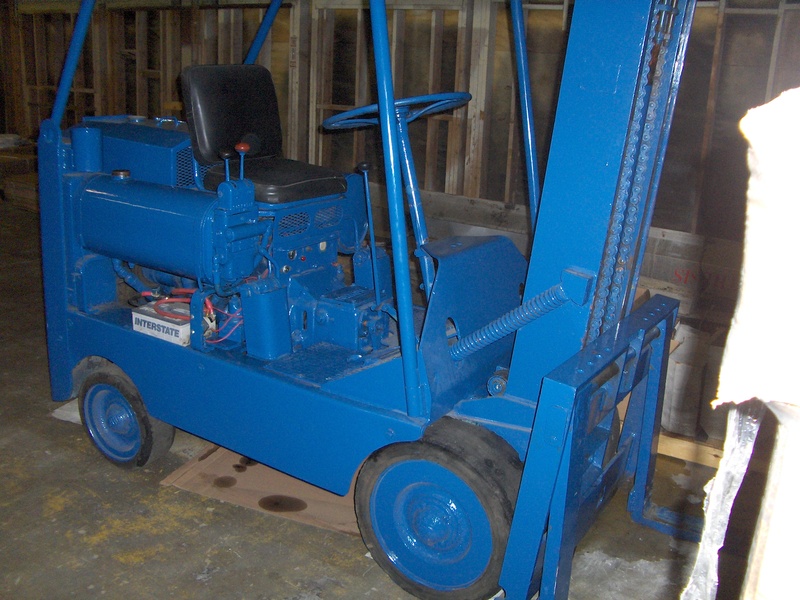 I e-mailed you earlier this year about a Towmotor we were restoring. Here are some pictures of the completed project. 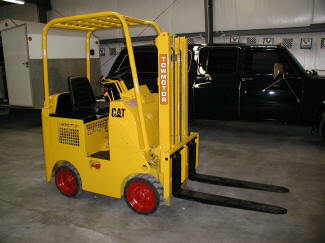 It has a Continental F135 motor, we found brakes, transmission and motor parts still available through Caterpillar. I have included a picture of the data tag as we still don’t know what year this model is, maybe you might know from the serial number? 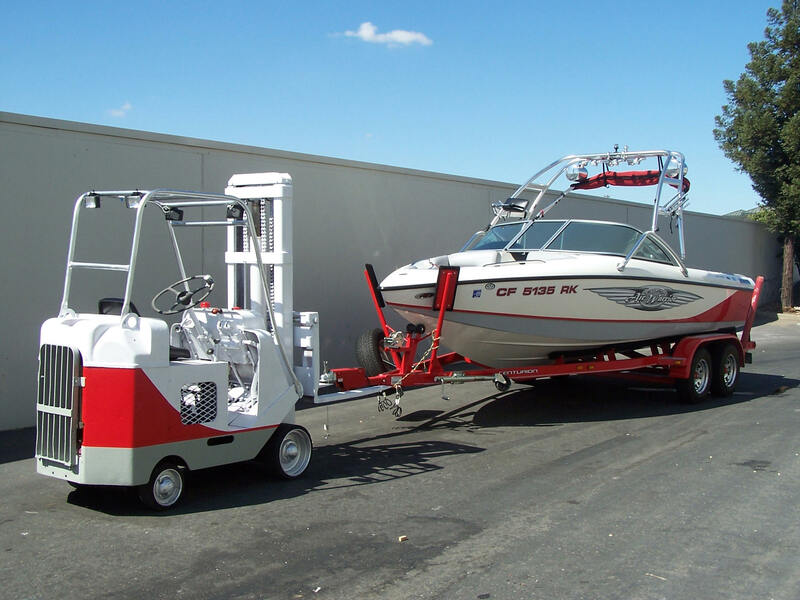 We use it regularly to move boats around and split atoms! It’d be great if you could put a picture of ‘Flossy’ on your website. 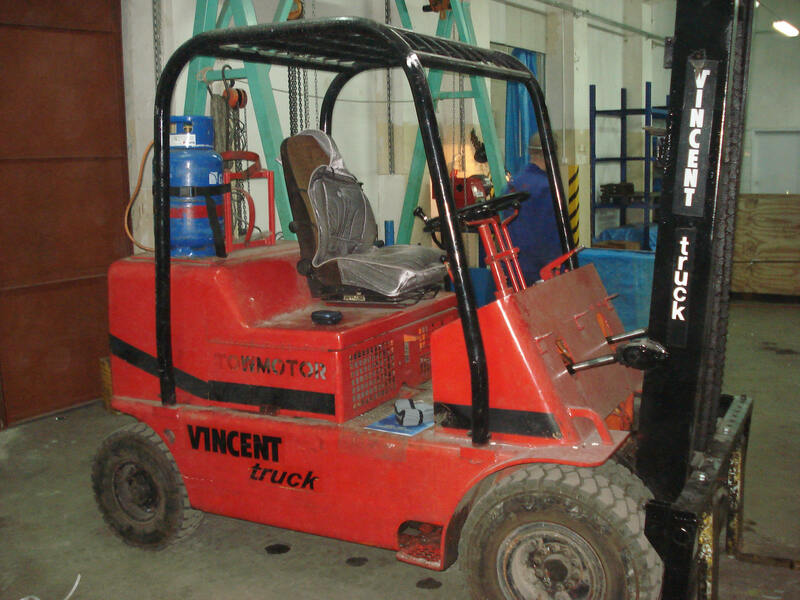 I find your great site when I was searching some parts to my father's forklift and decided to share also some photos of it. 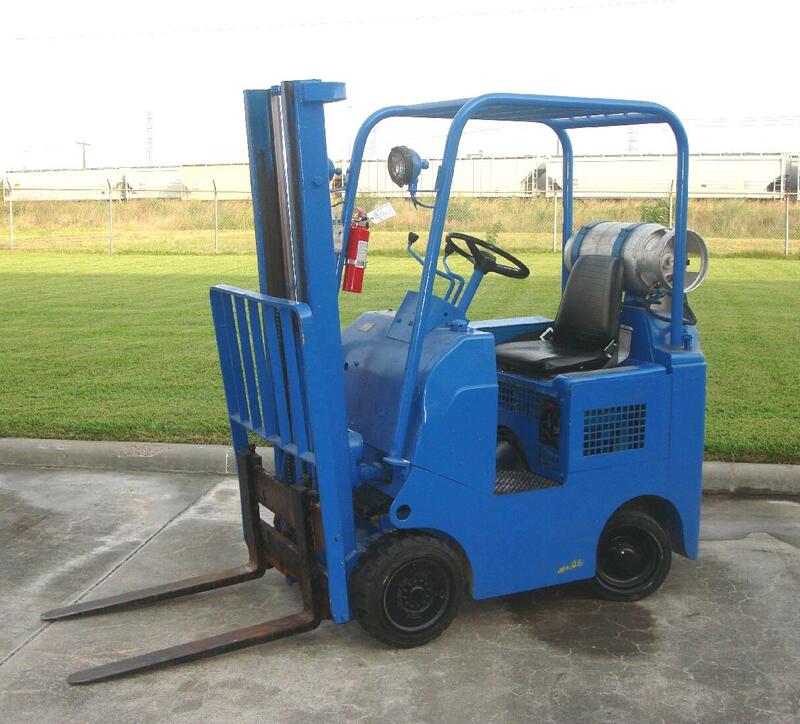 Model is Towmotor 502P -70, it is equipped with full free lift mast and runs with gas. It has been in every week use on our farm here in Lapua, Finland since 1981. 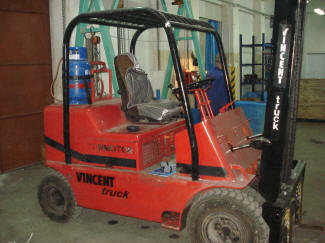 It has been very trustable, only some problems with powersteering and distributor. 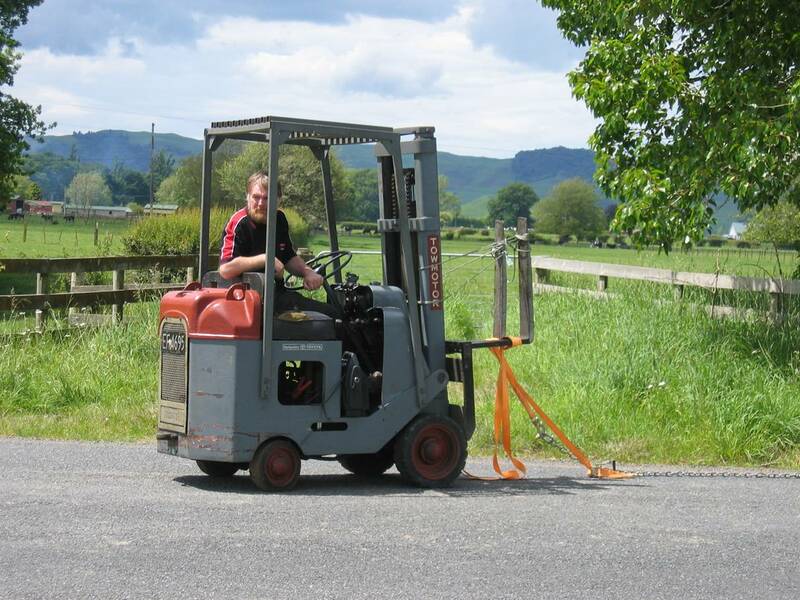 There has been a great help of it during these years when we have owned it. I just took over ownership of a marina and got an old TOWMOTOR with the deal and am in the process of getting it working again. 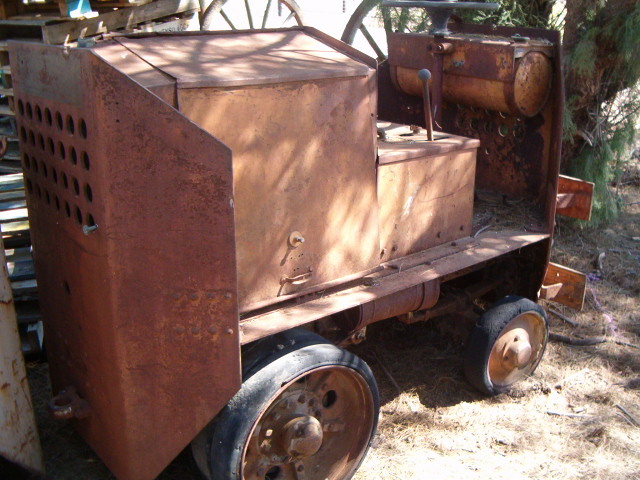 If anybody has any info on something this big and old to help me in restoring it, please let me know. South Bay, Long Island NY. Hi geert, my name is Patrick Clark and today I bought a 1958 six wheeled towmotor. Check out this one boys. she's a winner. Flathead six runs very smooth. 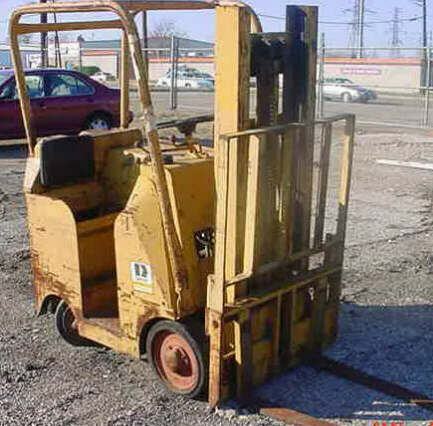 Goes offroad with a load. After sitting for a few months she'll start right up. I found her in the desert in California. I sold an old toyota forklift I was using and bought this one because it has a cool look to it and 2 more tires than my old one which means more stability when loading high roof or carrying heavy weight on uneven surface. Enjoy the pictures, Patrick. I spotted this Towmotor in the Dutch province of Zeeland. 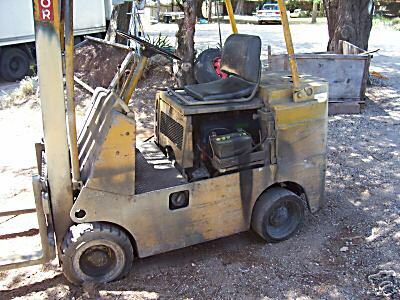 Here is a pic of a towmoter I just bought. 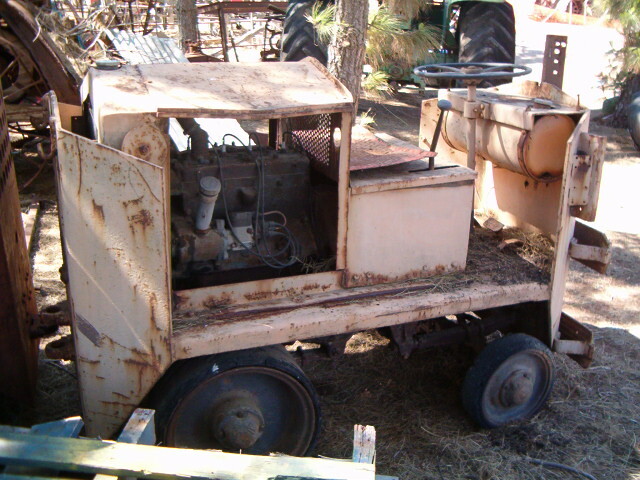 It needs some work on the starter and carburetor but Ive had it running and used it a few times already. I cant find a serial # or data tag on it. 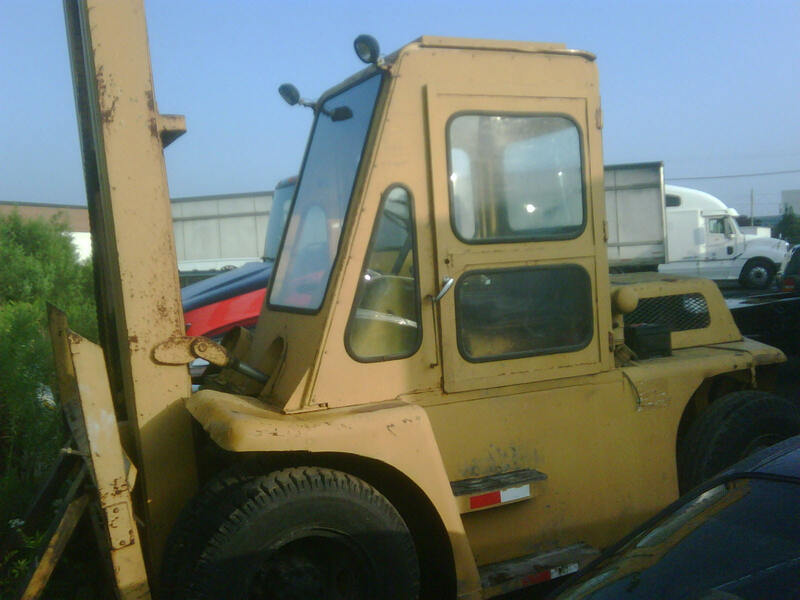 It may have been covered when the roll cadge was added. Great site you have and I send more pics when I get a chance to work on it some. 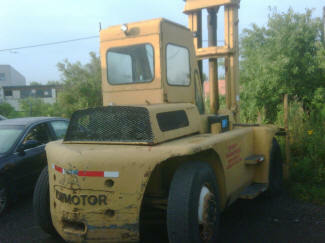 Geert - This is a Tomotor Tractor No. 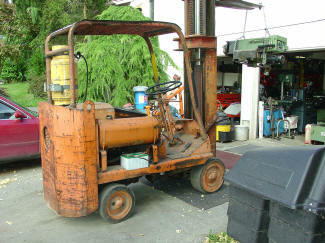 1022 Model B - built in 1920. Unbelievable ! 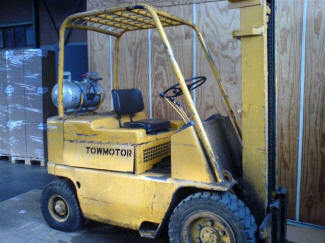 That was the second year Towmotor existed. Mr Larry Bosma from Harry's Motors send me this picture. I live in San Jose California U.S.A. 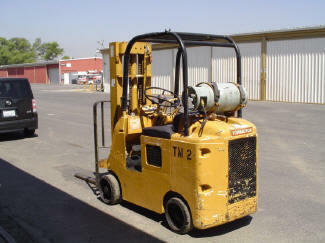 I rescued these Towmotors locally in San Jose. It's a 1954 LT35 & 1966 LT350. 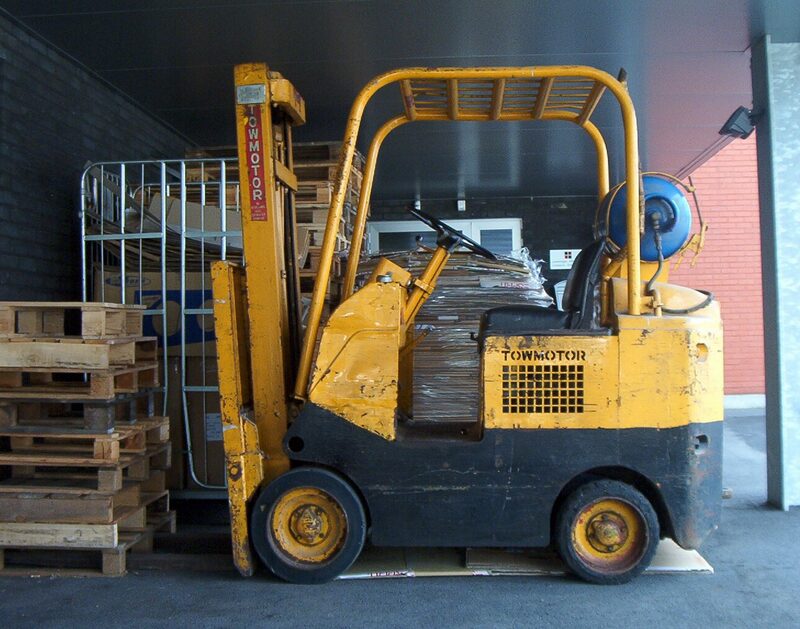 One Fork Lift is for spare parts. Iif anyone is in need please contact me at pbhamilton@att.net. 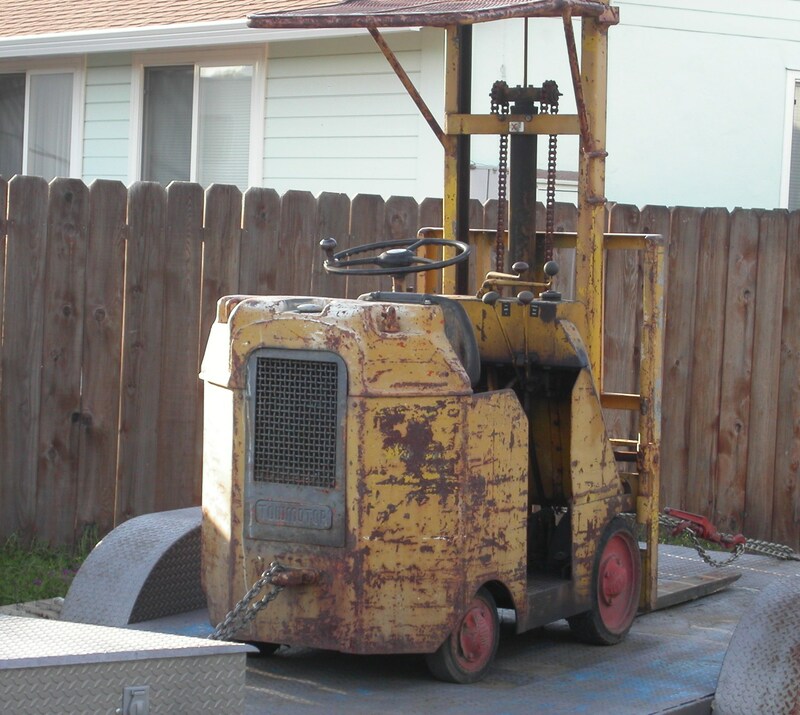 The other one I’m restoring back to original with new parts and paint. 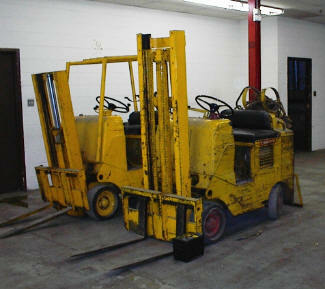 If anyone has any parts for these Fork Lifts please let me know. I like to meet other people who might be restoring these LT 35 Towmotors or have parts I could use. I will send you some more pictures of the restoration. 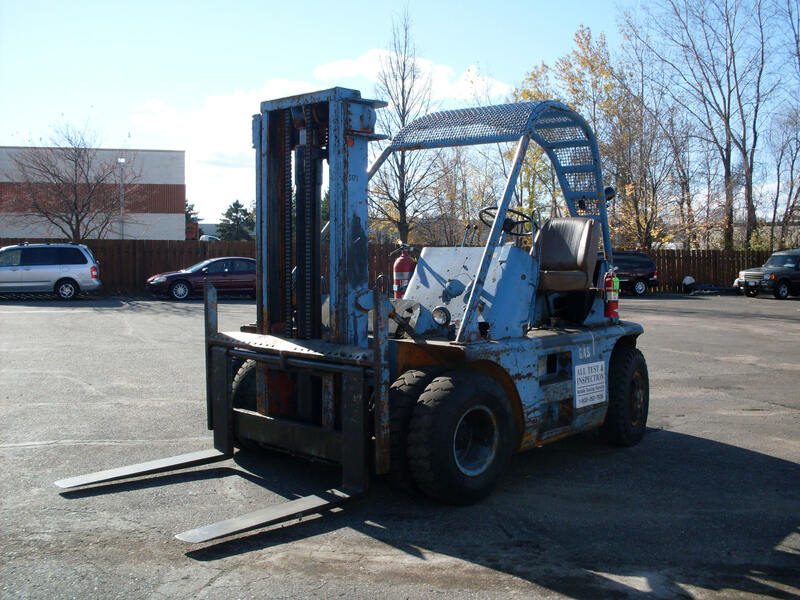 Mr Langs Towmotor in Helena, Montana USA. 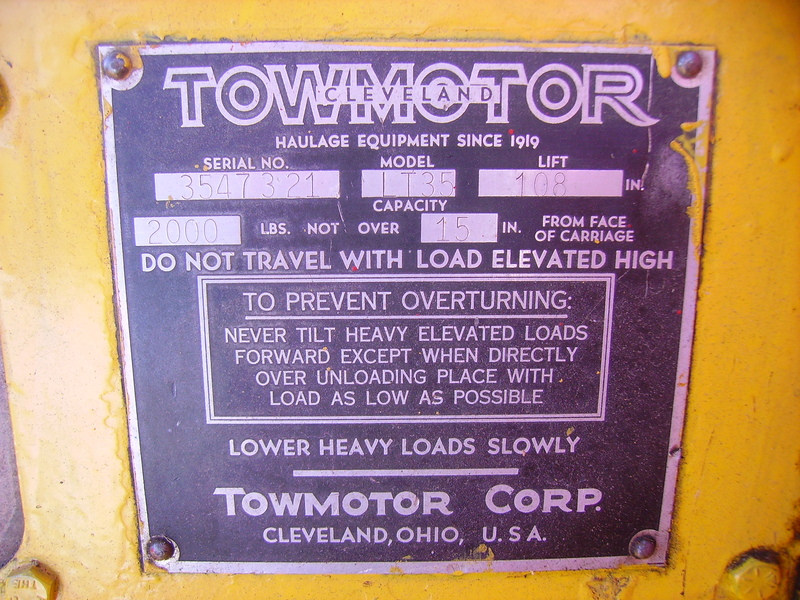 In 1965 Towmotor Corporation was sold to Caterpillar. 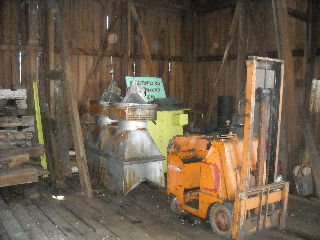 For a long time the machines were sold with both names on it. Towmotor Corporation changed its name to Caterpillar Industrial Inc. in the late 1980's. 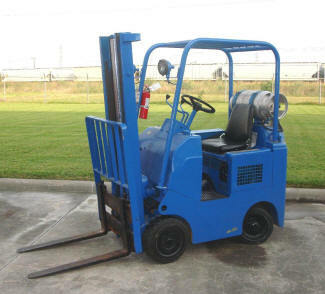 Then, Caterpillar and Mitsubishi Heavy Industries (Japan) formed a new company in Houston, Teaxas in 1992 -- MCFA. 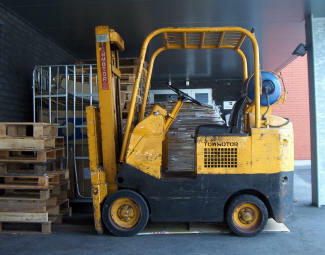 MHI owns 70% of the company, Caterpillar 20% and Mitsubishi Corp. 10%. 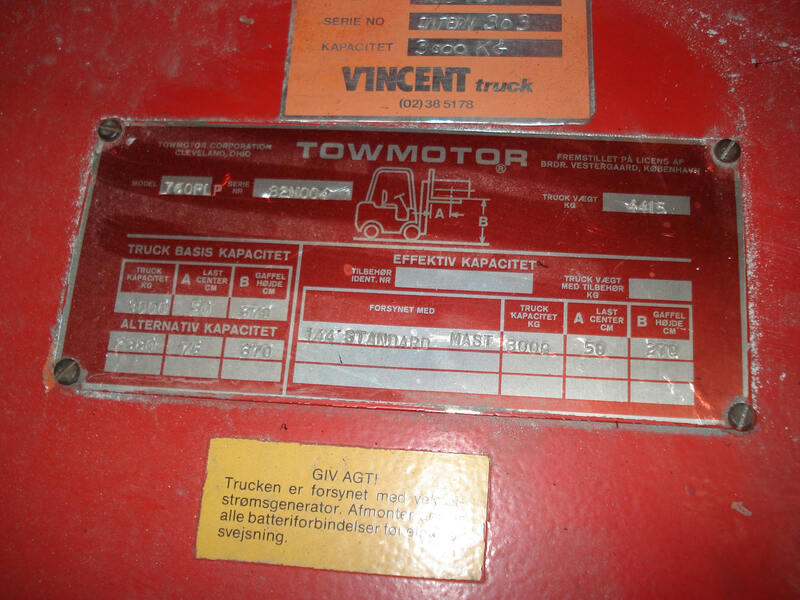 So, MCFA is really the 'ancestor' of the original Towmotor Corp. 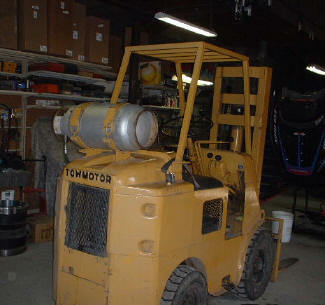 This is a 1964 Towmotor model 850 SLP 200 24. 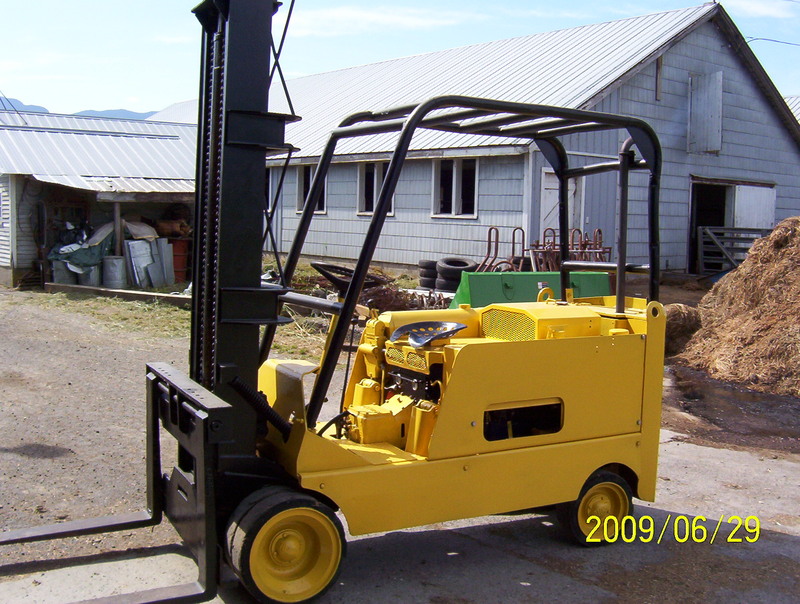 Coast International (rigging & millwright co.) works this powerful horse regularly. 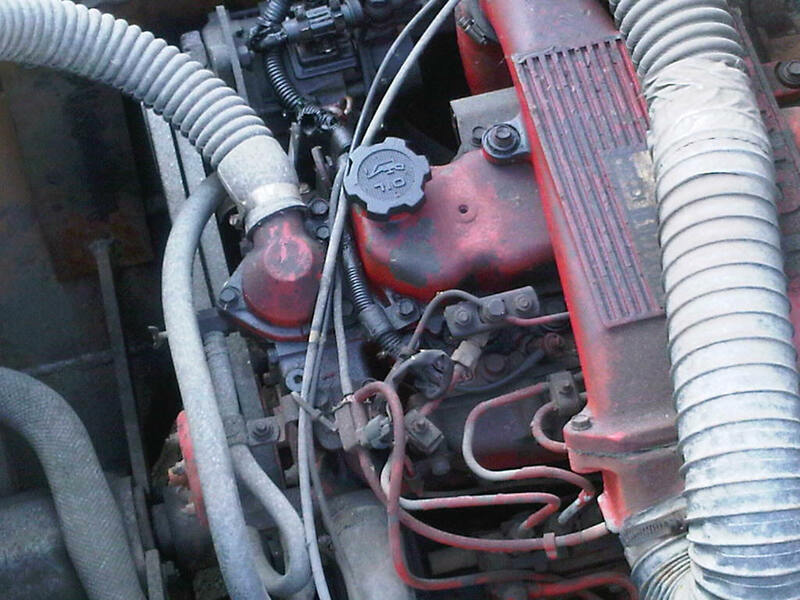 It has a V8 International engine and runs great. What makes this lift ideal for rigging is that it’s narrow and under eight feet tall with a capacity of 20,000 Lbs. 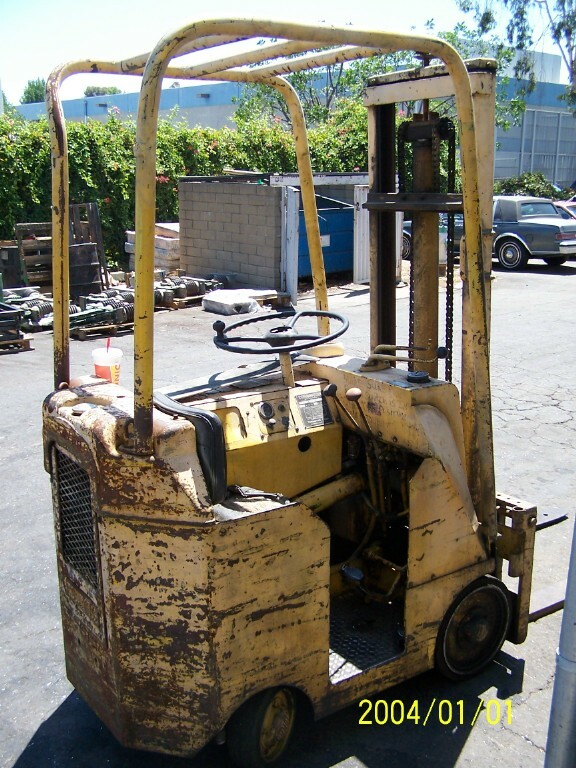 It’s truly a work horse! Small Towmotor from the Biggest state in the union. Send by Ed DeVoll - a Texan in the 4th generation. But guess what: Ed has a little Dutch blood in his veins! Here are the pictures of our Towmotor known to us simply as "The Yellow Forklift"
Thank you for putting up a wonder site to see your Towmotor as well as others around the world!